Bake 30 to 35 minutes or until golden brown and no longer doughy in center. Cool in pan 10 minutes. Turn upside down onto serving plate; pull apart to serve. Serve warm. Basically a pull-apart bread, monkey-style breads are an ideal way to use refrigerated flaky biscuits. Work quickly with the refrigerated dough, because it will rise better if it’s still cool when the pan goes into the oven. 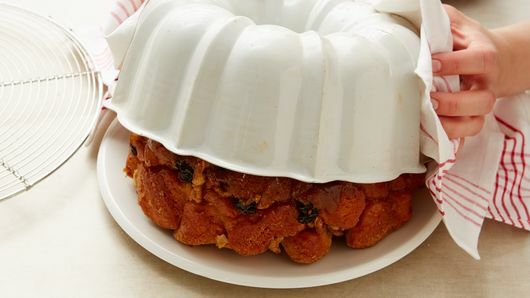 Large fluted tube pans come in a lot of designs—the most classic “bundt” pan has rounded sides, but a star-shaped or other tall tube pan will also work. Just be sure the pan can hold 12 cups (pour measured cups of water into it to check the volume), so there’s room for the spiced dough to rise up without overflowing. Greasing the inside well, getting into all the nooks and crannies, guarantees that the sticky bread will unmold easily. A fragrant ground cinnamon sugar to coat the dough is a favorite, but try a blend like pumpkin spice (cinnamon, ginger, nutmeg, cloves) or a blend of ground cardamom and freshly grated nutmeg. Switch up the dried fruit and nuts too, if you’d like. 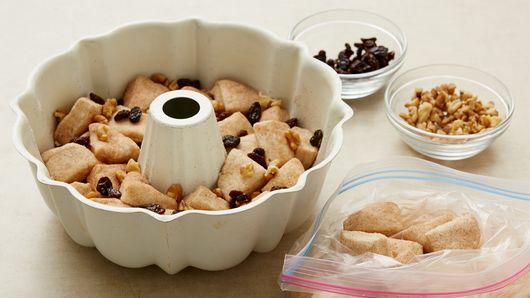 Golden raisins, dried cherries, chopped pecans, or cashews—any combo is delicious. But the essential ingredients that create that ooey gooey factor is the brown sugar-butter mixture that melds the rich dough together. Ever wonder how monkey bread was named? There are several theories, including one that says the loaf resembles the monkey puzzle tree, a relative of the Norfolk Island Pine. Another theory is simply that the pastry is eaten by picking apart the bread as a monkey would. 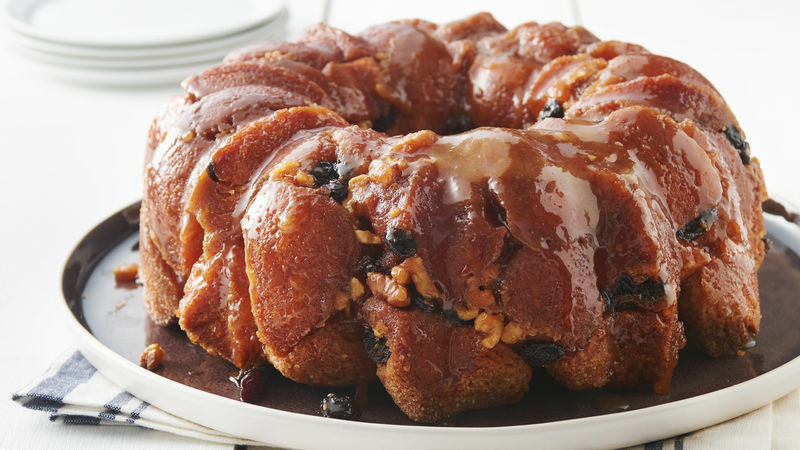 In 1982, former First Lady Nancy Reagan commented to White House Staff that monkey bread was named as such “because when you make it, you have to monkey around with it.” However monkey bread was named and came to be, we are happy that it did. To make it even better, we’ve cut the monkey business down by using just a few simple ingredients and completing the recipe in four easy-to-follow steps. 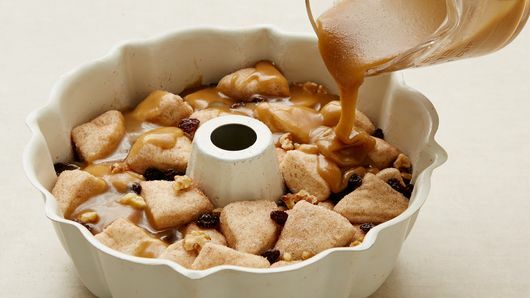 Combining the comfort food taste of Pillsbury biscuits with the sweet taste of warm caramel and cinnamon, this no-fail monkey bread recipe makes 12 servings. Add a glass of milk or serve with coffee and chances of any leftovers are significantly low. Once you’ve mastered this monkey bread, we’ve got more flavours for you to try out, from sweet s’mores to savory buffalo chicken.